This week, Tegan and Sara appeared on the holiday episode of 90210, performing the glittery electro-pop single "Closer" from their forthcoming seventh studio album Heartthrob. The twins join a long line of great bands that have appeared on teen soaps -- which have become a powerful marketing tool for independent acts over the past decade. The O.C., which aired from 2003 to 2007, was a trailblazer in this movement, paving the way for other shows to make indie rock a focus -- or, if you ask the show's creator Josh Schwartz, a main character. Everyone from The Killers to Modest Mouse to The Walkmen played The Bait Shop to an adoring audience made up of tastemaking Seth Cohen (played by real-life music geek Adam Brody) and his friends -- and the exposure these acts gained during a time when the music industry was grappling with an uneasy transition into the digital age was invaluable. 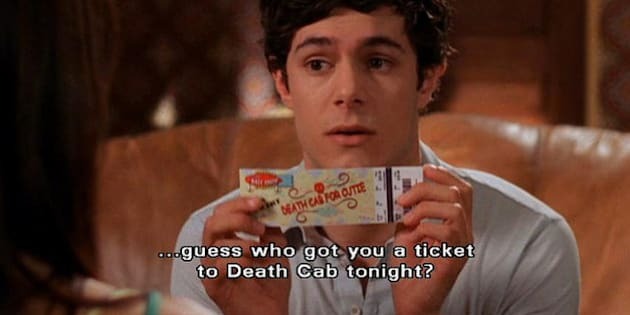 Rooney, the first band to play the show, told Rolling Stone it experienced a "200 percent increase in record sales" after its appearance while Death Cab for Cutie became briefly synonymous with Seth Cohen. While "the O.C. effect" is undeniable, it wasn't the first show to feature cool bands. Here's our list of the 15 best musical appearances on teen TV, from .